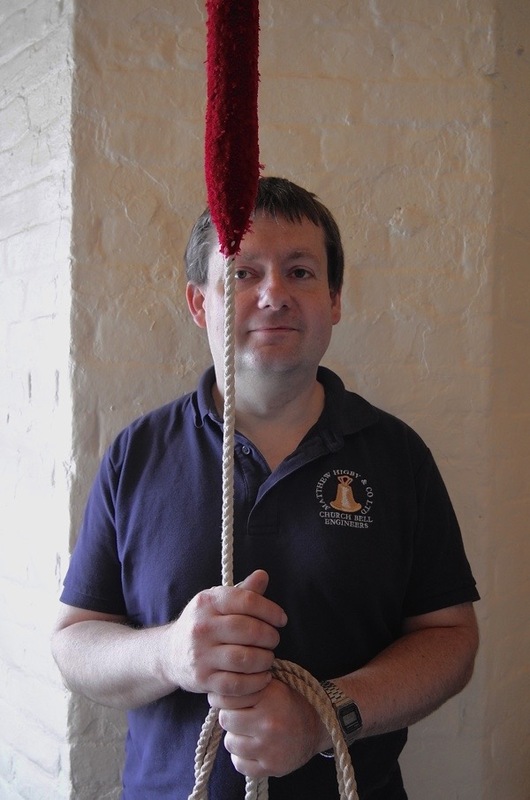 In this first of an occasional series of features celebrating the work of former employees of the Whitechapel Bell Foundry, I present my interview with Benjamin Kipling the Bell Tuner, who now works for Matthew Higby & Co, Church Bell Engineers. You can experience a virtual reality film of the Whitechapel Bell Foundry, The Final Bell created by VISUALISE, as part of ART NIGHT 2017 on Saturday 1st July 6-11pm in Spitalfields Market. On a recent Sunday morning, I joined Benjamin Kipling and his bellringing pals for a congenial breakfast in Waterloo Station after they had rung the bells before the service at St John’s church across the road. Once we had finished our chat, I accompanied Benjamin who could not resist returning to Francis Octavius Bedford’s handsome bell tower of 1822 to ring again after the service. With a new job in Somerset from Monday to Friday, Benjamin commutes back and forth by car each weekend to fulfil his bellringing commitments in the capital. 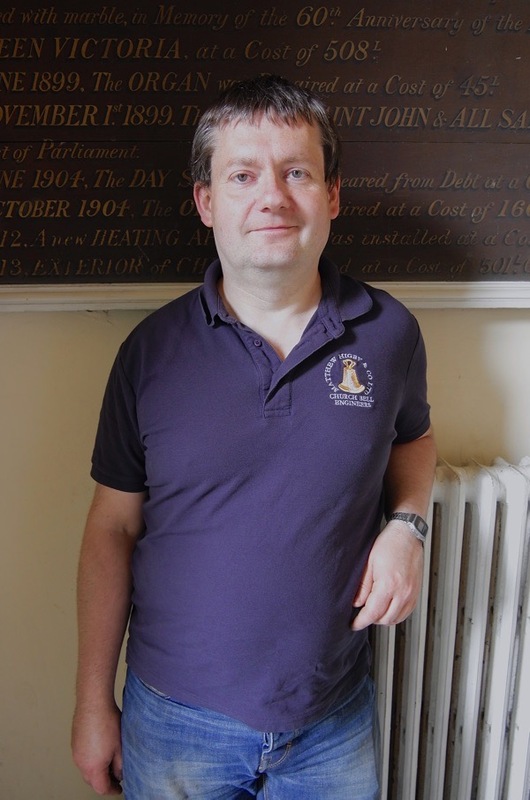 Even when we shook hands to say goodbye and he climbed into his sports car, Benjamin was setting off to judge a ringing contest in Cranford as a detour on his journey to the West Country – such is the passion of the man for bells. The Gentle Author – How should a bell sound? Benjamin Kipling – A nice bell should have a crisp, clear strike note, followed by the hum coming through underneath, and the hum should be stable and long-lasting. The Gentle Author - What does the job of a bell tuner consist of? Benjamin Kipling - Well, the basics involve mounting the bell, mouth upwards, on a very big vertical lathe and taking metal out of different areas inside to alter the partial tones within the mouth. A bell does not just produce a single frequency, a bell has lots and lots of different modes of vibration, and each mode of vibration produces a different frequency and therefore a different note. The standard for bell tuning for the last century has been to aim towards what we refer to as Simpson tuning, so the five lowest notes in the bell strike a minor chord. The Gentle Author – Why cannot a bell be cast to make the right sound? Benjamin Kipling – The thickness of the wall of a bell has to be precise to get exactly the right note and – to be perfectly honest – casting techniques just are not that good, they never have been. So to get a bell absolutely precise, the only way is to cast it deliberately too thick and scratch a bit off. The Gentle Author – Once a bell has been cast, are you the next person to work on it? Benjamin Kipling - The people in the loam shop dig the newly cast bell out from the mould, removing the core of bricks and loam, and doing a little bit of tidying up on the inscription. Then the bell is passed to me and I do a bit more work to the inscription just to make it looks as nice as possible. I start by putting the bell mouth down on the lathe and skimming across it to give a flat surface on the top before I turn the bell over, bolt it to the machine, and tune it. The Gentle Author – How do you assess a bell in order to tune it? Benjamin Kipling - This has been one of the limiting factors in the development of bell tuning. It was only in late Victorian times with the advent of the calibrated tuning fork that it became possible to accurately record the frequencies within a bell. Calibrated tuning forks were the normal way of doing things up until the nineteen seventies and Whitechapel’s tuning forks were still in use until the end – we used them sometimes to double check. Today, we have other ways of doing it. An electronic stroboscope tuner employs a microphone attached to a light which shines through a spinning wheel, and you can adjust the speed so that if there is a frequency in the sound that corresponds to the spinning wheel, it will appear to stand still. This is the method I use for finishing tuning bells because it is reliably accurate, but there is also a quicker – if slightly less accurate way – of pitching bells using a laptop computer and Fourier Transform software which instantly reads the main partial tones. The Gentle Author – So it is a question of striking the bell and then bridging the difference between what it is and what you want it to sound like, do you expect to get there immediately or is it a long process? Benjamin Kipling – Bell tuning is a job of many stages. Calculating what I am aiming for in a particular bell gives me the size of the gap. Usually, I try and make a series of cuts that will get me halfway between where I was and where I need to be, so I can check the bell is responding as I expect it to. Then I will go half as far again, and half as far again, and gradually close in, which theoretically means I never get there. Yet, in practice, this is engineering not mathematics and if I overshoot by a fraction of a semitone then nobody is going to notice. I try and tune a bell to within a cent, which is 1/100 of a semitone, but nobody is going to hear if it is two or three cents out. The Gentle Author – Are there different kinds of cuts you make to a bell? Benjamin Kipling – Only in terms of shallow cuts or deep cuts, but they are in different areas of the bell. For instance, if you cut metal out of the shoulder of the bell, the second partial tone flattens more quickly. In the middle of the bell, it is the hum note, the lowest one, that flattens the most quickly. Towards the lip, it is the nominal tone which flattens most quickly. Generally, wherever you take metal off a bell all of the partial tones will move – so it is a juggling act. The Gentle Author – What is the minimum number of cuts? Benjamin Kipling – One! But if you are tuning a bell and you are getting very close, you might make one little scratch and test it again, and make another scratch and test it again – it could take dozens. The Gentle Author – Do you rely upon your ears or instruments? Benjamin Kipling - The ear is always the final arbiter as to whether a bell sounds good or not. The instruments are there to tell me what is wrong and by how much. I can hear if something is wrong with a bell but I may not necessarily be able to tell exactly what is wrong or by how much, and that is where the instrumentation comes in. The Gentle Author – Tell me some bells that you are proud to have tuned. Benjamin Kipling - Absolutely. The five largest at St James Garlickhythe and also all ten of the new bells at St Dunstan-in-the-West on Fleet Street. The tenor bell there is the only bell where I have ever managed to get it to exactly where I want within a fraction of a 100th of a semitone. On paper, that is the best bell I have ever cut. In practice, bigger bells always sound better than little bells. They have more presence and more power, and so the best of all would probably be the largest bell I have tuned, which was for a carillon in the United States. It was cast at 43 hundredweight – a little over two tonnes – and finished at 37 hundredweight, after I tuned six hundredweight out of it. You could hit the bell, walk away, come back a couple of minutes later and still hear it humming. The Gentle Author – Is there an element of subjectivity in this work? Benjamin Kipling – There is more than one way to skin a cat. You get differences in character of bells and that can be down to how the tuner approaches the bell. Also, the shape of a bell varies according to who cast it. There are subtle differences between the profile of a Whitechapel Bell, the profile of a Taylor bell or a Gillett & Johnson bell. The Gentle Author – How did you become a bell tuner? Benjamin Kipling – At school, I did not like music very much which was maybe because I did not want to learn to play an instrument. I had an interest in music theory, but the teachers did not think it was worthwhile teaching me music theory if I was not going to be learning an instrument. So I dropped music at the earliest opportunity. Then, in sixth form, a friend of mine who was a bell ringer said, ‘Why don’t you come along on Wednesday night and learn to ring bells?’ So I did and I found it very addictive, and bell ringing became my hobby and I did a lot of bell ringing at university. I studied Physics, then I dropped out and started Computer Science, until I dropped out of that as well. I spent quite a long time at Nottingham University without getting a degree. Possibly, that was because I was spending too much of my time ringing bells rather than getting any work done. The Gentle Author – Yet you have managed to fit all those things together in your career, how did you enter the industry of bell making? Benjamin Kipling – There was a bell hanging company in Nottingham at the time, Hayward Mills. I got a holiday job with them and stayed for a couple of years. However, I discovered I was not keen on site work but I did like the theory behind the tuning of bells and, although Hayward Mills did not have a bell tuning machine, they were considering getting one. So when I dropped out from university, they took me on full time, doing admin and occasional bell hanging, with a view to me being the one who would do the tuning when they got a bell tuning machine which – a couple of years later – they did. The Gentle Author – Are you a self-taught bell tuner? Benjamin Kipling – Partly. I found some tuning graphs on the internet showing how the different partial tones respond according to where you take metal off a bell. But I had to teach myself how to drive the machine and how much metal to take off, which obviously is nerve-wracking and involves taking off tiny amounts to begin with and checking. Then you find the sound of the bell has hardly changed and so you take off a bit more, until you realise you actually have to take quite a bit of metal off to make any significant difference. The Gentle Author – Did you ever take too much off? Benjamin Kipling - The simple answer is ‘No.’ If you are gradually homing in on what you want, that should not be a problem. In practice, with four of the five partial tones, it is possible to go back up again if necessary. Generally, you are thinning the wall of the bell and making it more flexible so it vibrates at a lower frequency. Each time you take a little off, the notes go down. However, by taking more metal off the lip of the bell, it is possible to get four of those five to come back up. So there are usually ways of sorting these things out. The Gentle Author – Do you find this rewarding work? Benjamin Kipling - Oh absolutely, it is a lasting legacy. Hopefully my handiwork will be there for centuries because bells do not go out of tune. A lot of old bells were never in tune to begin with, they would just try and cast a bell as close as they could to the right note and, if it was a long way out, they would take out a hammer and chisel and try and chip bits off until it was bearable. That is the reason why old bells are retuned. The Gentle Author – Is retuning a major part of your work? Benjamin Kipling – Oh yes. At Whitechapel, probably half of the bells I tuned were old ones that came in for retuning. The Gentle Author – How is that different? Benjamin Kipling – The difference is that, whereas a new bell has been cast with enough metal in the right places to be able to do what you want, in an old bell the chances are there may not be enough metal in the places you need. You just have to try and push it in the right direction as much as you can. In the last few years, we tended to do more tuning of old bells on the outsides as well as on the insides and I found you can get much better results by doing that. The Gentle Author – What are the oldest bells you have retuned? Benjamin Kipling – Bells over a certain age tend to be listed for preservation. The Gentle Author – They cannot be retuned? Benjamin Kipling - It means there is a presumption against tuning, but different dioceses have a different interpretation of what that means. In some dioceses, you will never get permission to tune a listed bell, while in other dioceses – as long as you put a sensible case forward – they have no problem with you retuning anything of any age. The diocese that I have found which is most likely to give permission for tuning old bells is Bath & Wells. There were some bells in Bath & Wells diocese from the fourteenth, if not the thirteenth century, that I have tuned. The profile of bells and the composition of the bell metal has changed remarkably little in all those years. The Gentle Author – Does bell tuning make you happy? Benjamin Kipling – Absolutely, when people ask me what my job is, I like to see the expressions on their faces, ranging from disbelief that there could be such a job to complete fascination. The Gentle Author – Tell me about the Royal Jubilee bells. Benjamin Kipling – These were cast for St James Garlickhythe but first they were installed in a barge to go down the Thames as part of the Royal Jubilee pageant in 2012. The Gentle Author – Where were you on that day? Benjamin Kipling – I was close to St James Garlickhythe, struggling to get to the water’s edge to catch a view of them going past from the bank of the Thames, along with umpteen thousand other people, but the crowds were so deep that I missed them. The framework was fabricated at an engineering company in Edenbridge, so I did hear them and got to ring them on the frame in the works even if I never got to hear them on the river or see them in the barge. The sound of bells tends to bounce off water in a pleasing way. Certainly, I know the bells at St Magnus the Martyr at the northern end of London Bridge sound at their best if you stand just the other side of the river and I think the same is probably true of the Southwark Cathedral bells if you stand on the north bank. People told me my bells did sound very nice on the river. Now, THAT is a worthwhile occupation! Absolutely fantastic. Thank you Benjamin Kipling for sharing your skills and enthusiasm for the wonderful Bell. Like the majority, we had no idea of how a bell comes into life nor what skills are needed to create them so it is a reall pleasure to read The Gentle Authors interview with you today. My better half and I love the sound of bells, we hear several where we live on the IOW. There are three different bells rung at different times each day, from our right at St Cecilia’s Abbey which the Nuns ring, the second bells from our left at Quarr Abbey which the Monks ring, then we delight in hearing a 2 hour bell practice from St Mary’s Church every Tuesday. Life would not be the same without hearing those bells, apart from confirming the time and the day, the bells are so beautiful they bring something quite magical and enriching of their own into life, which were these bells to stop, we would miss their sounds so much it would be rather sad. We really appreciate people like yourself who are doing all they can to keep the bell alive. Bells are important to us Islanders and we feel privilaged to hear a sound which is gradually diminishing. So keep up your wonderful work Benjamin, we really appreciate what you are doing. Hope we learn more from you. What a wonderful post! I really enjoyed it, especially as I was lucky enough to go on the very last tour of the Whitechapel Bell Foundry before it closed, so I could picture the various processes Benjamin Kipling described. After my visit, I was so impressed that I did a blog about it. You will find it on my Elizabeth Hawksley website under the category Exploring London on April 2nd, 2017, and a reprise on Aril 9th, 2017. And thank you, Gentle Author, for your intelligent and thoughtful questions, which were pitched just right! I am delighted that Benjamin got another job after the sad demise of the Whitechapel foundry. What a brilliant interview – shrewd questions and fascinating answers. One of your very best. Something that is interesting to note about Ben and his work is that one of his last jobs at Whitechapel was the retuning of six bells which used to hang at Christ Church, Lanelli, in Wales, and are to be hung as a ring of eight in Dunmanway, Co. Cork, Ireland, and his first job at Matthew Higby and Co was to tune two new bells to match this six, thus completing the eight bells, and the match is seamless. These bells will be hung at Dunmanway in the next few weeks.